My parents celebrated 41 years of marriage this month. Instead of gifting them with some snazzy "couple" gift like matching snuggies, I went with separate gifts since marriage really means a husband and wife making a conscious choice to stay in it to win it. For my Mom, I bought us two tickets to Heart Day 2011. Our all-expense paid trip included an EKG, lipid profile, blood pressure screening and metabolic profile. 1. My mother was adamant I should have filled out the above form albeit it was only required if you're over 40. Let my attachment disorder commence. 2. Do not wear spanx for an EKG meant to begin and end quickly. Specifically, not a onesie. It's okay to sport a muffin top when medical professionals are weighing you. 3. The man who reads your test results and starts commenting on them with words like "pulmonary" and "medicinal" is probably a doctor. My mom questioned his qualifications when he didn't chest bump her for high blood pressure. 4. After fasting for 12 hours, we were on the prowl for coffee. The hospital was kind enough to serve it on the side of doughnuts, cinnamon rolls and snack packs of M&Ms. I'm guessing it was the "Screwyourtestresults" buffet. 5. My mother is the proud parent of a heart-of-an-athlete daughter. Although she's not really sure how old I am, she can rest assure my ticker's a good one. 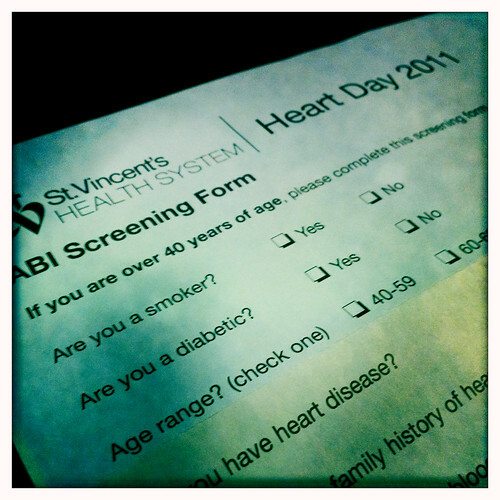 Serious Sidebar: 90% of women have one or more risk factors of developing heart disease, the #1 killer of women. Check out the American Heart Association for great tips on reducing your risk! When I turn 41 (because if you wait until I have my 41st wedding anniversary, we'll both be dead by then), please buy me something better than an EKG. C: No worries - you're getting a dental exam.